An official poster for 10 Things I Hate About Life. 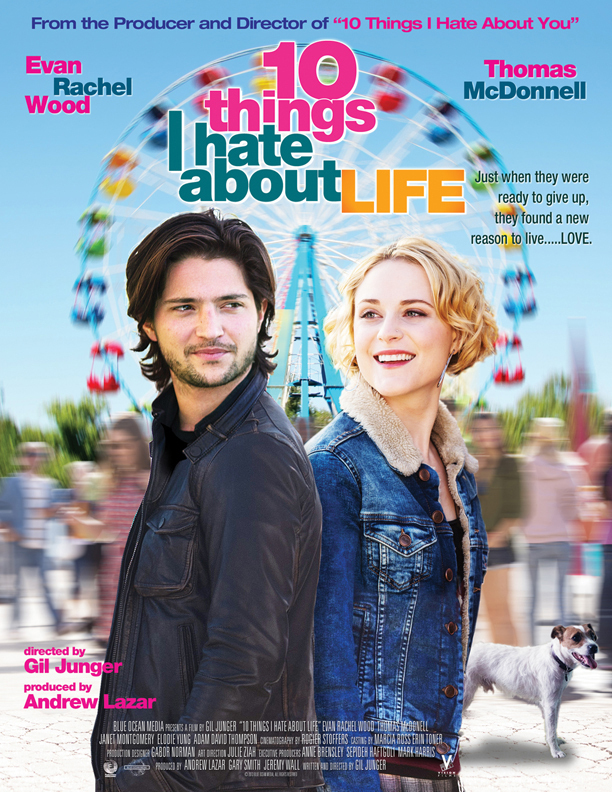 10 Things I Hate About Life is an unfinished romantic comedy film that also served as a spin-off to the 1999 film 10 Things I Hate About You. The movie was based on the novel of the same name and was directed by Gil Junger. Originally set to release in 2014, a series of setbacks during production caused the film to never be finished. A portion of the film was shown in 2013, but no known of the portion of the film that was shown to test audiences exist. While no official plot for 10 Things I Hate About Life was ever released, it is assumed that it would follow the plot of the book. In the book, a young man and a young woman meet each other and fall in love right when they are about to kill themselves. Their crazy experience causes them to bond and become closer to each other. The couple goes through the ups and downs of a relationship throughout the book. On May 9, 2012, it was announced that director Gil Junger would direct 10 Things I Hate About Life with filming set to begin in November of 2012. In the same announcement it was stated that actress Hayley Atwell would play the star lead. Eventually, the lead role changed to actress Evan Rachel Wood. It was not until December of 2012 that production of the film began. On February 26, 2013, Intandem Films CEO Gary Smith stepped down. With this production on 10 Things I Hate About Life came to a halt as Intandem Films was the studio behind the film. It was a priority to get 10 Things I Hate About Life back into production. Despite actress Evan Rachael Wood being pregnant, Intandem Films insisted that it was due to financial issues that caused a delay in production. A half an hour of the film was shown the American Film Market in November of 2013 where it was announced that Evan Rachel Wood would still be the lead actress when production continued. At the screening, the film received mixed reception. Eventually with all of the production delays, Evan Rachel Wood left the project in 2014. While a lawsuit was filed against Evan Wood, but it was not successful. As funding for 10 Things I Hate About Life ran out, no attempts were made to recast the people who already left or continue production on the film. The half-hour-long portion of 10 Things I Hate About Life that was screened at the American Film Market has never resurfaced. Due to the legal trouble involved, it is unlikely that the half-hour-long portion of the film can be released. An official trailer, some production photos, and a poster are the only parts of the film that have surfaced. The official trailer for 10 Things I Hate About Life.